Would you like to know what and how astronauts eat in space? 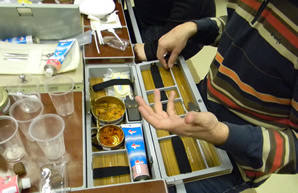 Space food significantly differs from our usual food which we eat every day at home; first of all, it is specially cooked and, of course, specially packed. 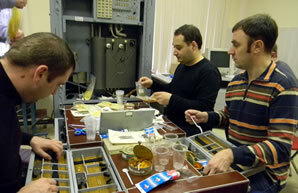 We have the opportunity not only to learn but also to taste the space food and to try to cook it with the help of a special simulator, which is the part of the astronauts’ training technical means on the ISS Russian Segment life-support system. It is designed for astronauts’ training on cooking and rational using of space food onboard the orbital complex. Just imagine how difficult it is for astronauts to do simple life things which really seem so easy for us! They live in the conditions of permanent weightlessness! And even lunch for them is a whole activity when they should use all their skills gained during the training sessions in Star city. 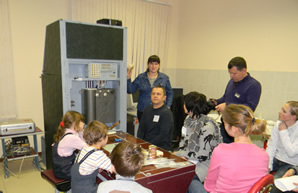 Crews learn on the ground how to heat canned food in the specially designed electrical heaters, to fill dry food packages with water trough special adaptors from Water system (СРВ-К2М). While filling packages with water astronauts should be very careful because any incorrect movement in weightlessness can cause a lot of trouble for the crew. The table layout is also not regular. For special food they use special utensils, which differ from our usual, for example, the table is equipped with unknown on the Earth unit with a weird name “crumb catcher”. 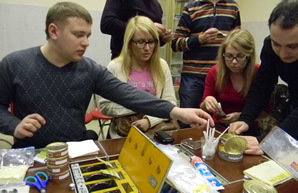 What it is and what other unusual devices are used in space, what peculiarities astronauts face when eating space food and how it tastes – all these and many other interesting facts can be learnt about during a special class on the Space food! The history of Yuri Gagarin Cosmonaut Training Center begins since the 11th of January, 1960, when upon the initiative of S.Korolev, chief designer of rocket-space systems, it was decided to establish an air force based organization for the first space flight training. All of us at least once in our lives dreamt of flying. We don’t have wings like birds do, but nowadays wings are not required any more for people to fly. It becomes possible with help of zero-gravity conditions. Let your dream come true! You have this chance if you perform a flight onboard the IL-76 MDK laboratory airplane like cosmonauts do during their space flight training. You are brave enough and want to examine yourself? 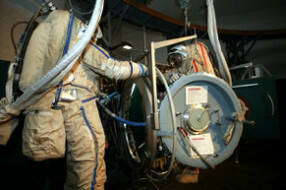 You dream of feelings that cosmonauts experience during their real training for space flights? 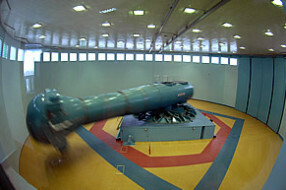 In this case the Centrifuge run is exactly what you need. 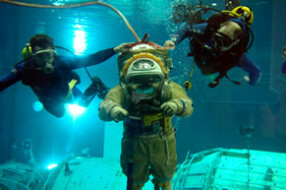 We are offering you a unique opportunity to feel yourself a real cosmonaut working on the external surface of ISS in the ORLAN extra-vehicular suit by diving into Neutral Buoyancy Laboratory. 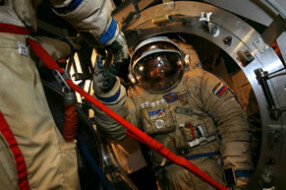 To be an astronaut in the open space is such a stunning outstanding performance, but very complicated job as well! Just imagine, how they can stay in a support-free space wearing a huge spacesuit, staying outside their space home, when the endless space is around, and to work for hours there – isn’t it really breathtaking!? Meanwhile this kind of activity is also a routine for astronauts-heroes and nowadays this is a rather regular operation performed by every expedition onboard the ISS. When we think about astronauts – every time someone wearing a spacesuit comes to our mind. But few of us know that spacesuits can be different and the most interesting thing is that it’s possible to try it on and even to control its systems. This is not so simple, by the way! 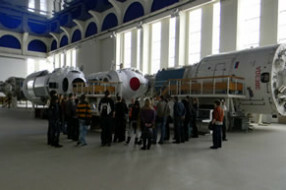 This unique experience can be gained in the Gagarin cosmonaut training center in Star city. This will be an unforgettable space adventure, and your photographs wearing a spacesuit will become a real family heirloom for pride. Everyone of us has had a dream in childhood to fly to space one time at least. This dream doesn’t seem to be so unreal as it seems for the first sight. 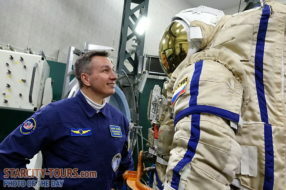 Our specialists will help you to plunge into the world of real astronauts and to learn how the spacecraft looks like and how it operates, Note that this spacecraft is used not only by Russians but also by astronauts from all over the world. 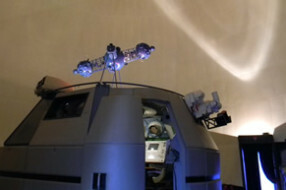 Don’t miss the chance to visit our famous space planetarium! No doubts it won’t leave you indifferent! This is the place where you can find yourself under the starry skies even in daylight and learn how to recognize different constellations of Northern and Southern hemisphere! Planetarium is meant for studying the celestial sphere and training astronavigation with the help of nominal optical-visual devices. 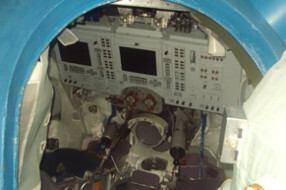 The main peculiarity of the “Don-Soyuz” simulator is the opportunity to manually control the real spacecraft. Regular nominal flight are performed in the automatic mode and manual operations can be done only under the commander’s decision or command from the ground Mission control center. Nevertheless manual control skills are necessary for every crew member. 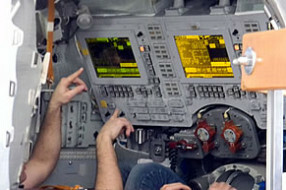 Now you also will be able to learn how to control Soyuz-TMA spacecraft, which delivers astronauts to space. During the training you can, for example, dock to the International Space Station, that is a very complicated and vitally important task for the crew. No doubt, that a lot of us have heard about the International Space Station and that it flies around the Earth and astronauts live there during their long-term missions to space. To get to know from the first source how they really live and work onboard the ISS, to learn interior of the Station – this will be the most interesting and outstanding experience which can be gained in the Cosmonaut’s training center. As it is known, first days of the space flight many astronauts feel some difficulties with adaptation to microgravity, or weightlessness. Some astronauts even can have motion sickness. 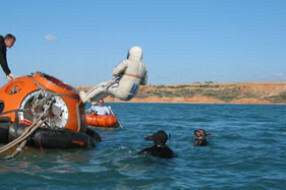 Therefore scientists of GCTC had developed special vestibular training programs for astronauts, in order to get used to such irregular conditions. 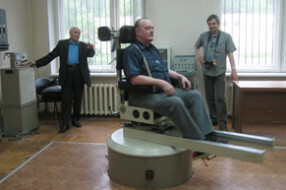 Spinning chair, tilt tables, simulation (optokinetic) drum are used for astronaut’s vestibular training. It is well known that during space flight various off-nominal situations can occur. But besides that, during the space flight training it’s important to consider such emergency situations which make the flight continuation impossible, and the crew has to return back to the Earth with help of emergency survival means. On the 4th of October, 1957 the first artificial satellite was successfully launched into space. This was the first step of fulfilling man’s long-cherished dream of conquering the space. The first human space flight of Yuri A. Gagarin onboard the “Vostok” spacecraft (April 12, 1961) announced a new space era in the history of a mankind.